Darleen Nixon has been a glass artist since 1998. Living on San Juan Island off the coast of Washington, much of the inspiration for Darleen's Designs comes from the natural beauty of the ocean that surrounds her. Her studio offers a serene and creative environment tucked quietly away in the woods where deer, raccoons and otters visit often. She continues to explore the endless possibilities of manipulating the molten glass into the intricate designs of her glass art. 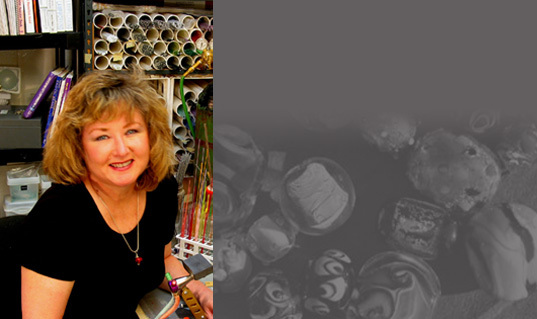 Darleen has studied with some of the leading glass artists in the United States and is a member of the International Society of Glass Beadmakers and the Glass Art Society. Her work is carried in galleries throughout the U.S. The origins of working with glass date back centuries. The process this artist uses continues to be referred to as "lampworking". The early artisans used wax or oil lamps to heat the glass allowing them to shape the glass into their design. Often the lamps were used with bellows to provide air for creating greater heat. Fortunately, today artists have the benefit of improved technology. Darleen uses an oxygen-propane torch that melts the glass at approximately 1800 degrees Fahrenheit. The glass used is a soda-lime or "soft" glass that is imported from Murano, Italy. This excellent Italian glass offers a wide variety of vibrant and unique colors. The glass becomes the consistency of honey when melted and must be worked keeping the bead in the flame. If it cools too quickly, you risk the glass cracking or shattering. Darleen often incorporates fine silver leaf or gold leaf with the glass in her designs. 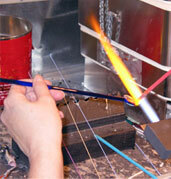 Each bead is hand sculpted, one at a time, on a steel mandrel. When the bead is complete it is quickly put into a kiln at a temperature of 950 degrees. The bead is then slowly cooled for a number of hours as the electronically controlled kiln gradually lowers the temperature. 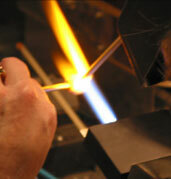 This process is known as "annealing", and insures a stable glass bead that will be a lifetime treasure. While our tools and equipment have improved over the centuries, the artistic process still remains the same. Each glass bead is individually designed and shaped in a coordinated concert of the artist's hands, the glass and the flame.